As it turns out, William, Linda and Blade are also all vaguely-defined secret agents, who are trying to get evidence of an equally vaguely-defined deal between the Triad and an Australian crime syndicate. We see Linda in a big, puffy, bright orange blouse and Blade in an ugly sweater and whitewashed jeans sneaking into the Triad headquarters. They’re not dressed as discreetly as you might expect from such seasoned agents, but maybe such garish clothing counted as discreet in the late 80s. Whatever the case, they’re the professionals. They must know what they’re doing, right? Well, the way they go about scooting and shuffling through the headquarters, ducking around corners and craning their necks around doorways, you might wonder. Linda crouches behind a couch to take pictures of the deal going down, while Blade peers at the villains through the glass of a terrarium. They’re soon spotted by the Triad, and a martial arts battle ensues. Blade and Linda escape unscathed, and Linda travels to Perth to present the evidence to the Australian authorities. Unfortunately, she finds herself in that staple of 80s action movies, the abandoned warehouse. She's attacked and killed by a group of the mob boss’s henchmen, who are all, for some reason, wearing animal masks--an odd, little detail that would be creepy were not for the jeans and sweaty tank-tops they’re also all wearing. Not only that, but the suspense in this scene is undermined by repeated and unnecessary cuts back to Blade arriving in Perth by plane. We all know James Bond darts from one exotic locale to another, but we don’t need to see him sitting and looking at his watch impatiently as his plane slowly taxis down the runway and pulls up to the gate. On top of it all, Blade is clearly flying coach, detracting from the aura of glamor most secret agent movies strive for. Lucky for us, though, Blade didn’t check any luggage, so we’re spared a long scene at the baggage claim. Day of the Panther picks up after this excruciating scene, as Blade infiltrates the crime syndicate and begins to take his revenge for the death of his partner. The majority of the fight scenes are well-choreographed, no surprise since the film was directed by Australian genre vet Brian Trenchard-Smith, who helmed Stunt Rock, Escape 2000, Dead End Drive-In and BMX Bandits, among many, many others. It’s obvious he knows his way around a cheesy action flick. As an added bonus, the DVD of Day of the Panther boasts the crispest presentation of any 50-Pack movie yet. Most movies in these sorts of collection are transferred so poorly and are so badly cropped you can barely make out the actors on screen. This one looked like a real, genuine movie, rather than some strange, murky, forgotten home video only you and the editor have ever seen. And if the countless kung-fu battles bore you, don’t worry, there are a handful of awesomely bad moments. Take the random and pointless scene where Blade is pumping iron in the gym and a be-spandexed, feather-haired woman walks in, pops a cassette tape into a boom-box and commences to Flashdance. Anybody else seen Day of the Panther? Any favorite silly moments? Any favorite Brian Trenchard-Smith movies? 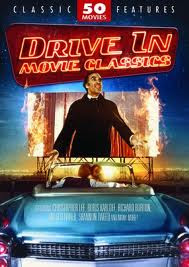 Mine's gotta be Dead End Drive-In. Nice review. Check out the sequel. Too many silly moments to mention. Favourite Brian Trenchard-Smith movie?...gotta be TURKEY SHOOT! Lee--Thanks for stopping by. I'll definitely check out the sequel, since Day of the Panther was such a good time. I have yet to see Turkey Shoot, but it's on my list. Least favorite Trenchard-Smith film? DC 9/11: Time of Crisis.